and Soars into the Sky. • Designed for Easy Assembly. Kite can be assembled in 1 minute. No Worries. Everything is Included! • Just add wind, 5-20 mph, and you're ready to soar. 3. Clip on Kite String. That's it. You're ready to fly! 30 days, no questions asked, money back guarantee if unsatisfied with the product. Click the Add to Cart Button at the Top of this Page to Start a New Adventure in Kite Flying! ✅ WHILE OTHER KITE BRANDS are difficult to assemble, break easily and don't fly well, the Moong Glow Sports Delta Kite assembles quickly and is a very easy to fly kite. Strong sewing, ripstop parachute nylon and reinforced support struts can take a beating so your day of kite flying fun will finish with all smiles. ✅ FUN, FAMILY AND MEMORIES, that's what it's all about. Escape from TV, computers and video games and spends some quality family time off the couch, outside at the beach or park flying kites and having fun. ✅ PERFECT KITE FOR BEGINNERS AND EXPERIENCED FLYERS: Boys, Girls, Kids and Adults of all ages will love the delta kite. 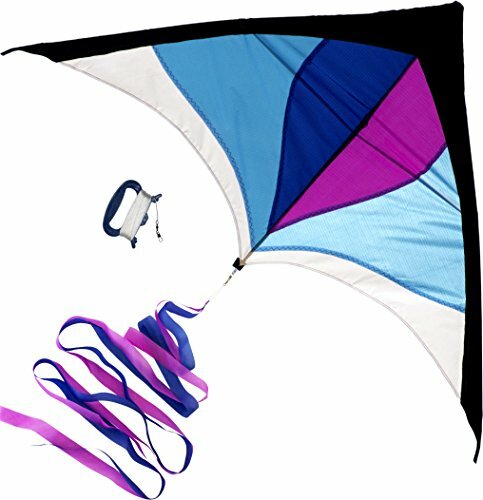 The large nylon kite is 60" wide and delta design enable this big kite to fly well, even in low wind conditions. Long 200 foot kite line allows this stable flying kite to reach high in the sky. ✅ CONSTRUCTION IS A SNAP: The delta kite comes mostly assembled. Simply insert the support rod into the connectors and clip on the kite string and tail. That's it. Everything needed to fly is included plus some spare parts, carry Bag, Simple to follow printed instructions included and Kite Flying Tips ebook. ✅ OUR MISSION is to bring family and friends together to have fun while being physically active outdoors. Nowadays we are all so tied to technology, it's literally a breath of fresh are to go outside and have some fun. And of course, your satisfaction is 100% guaranteed. We're not happy unless you are totally happy . If you have any questions about this product by Moon Glow Sports, contact us by completing and submitting the form below. If you are looking for a specif part number, please include it with your message.